Sometimes our past holds us back from going forward, and sometimes we are hold on to the past and this also keeps us from going forward. +We have already gone through the past. Now it’s time to let it go and get over it. +To move forward with past struggles is to bring setbacks into our future. “Brethren, I do not count myself to have apprehended; but one thing I do, forgetting those things which are behind and reaching forward to those things which are ahead, I press toward the goal for the prize of the upward call of God in Christ Jesus. Therefore let us, as many as are mature, have this mind; and if in anything you think otherwise, God will reveal even this to you”. (Philippians 3:13‭-‬15 NKJV). 11 For I know the thoughts that I think toward you, says the LORD, thoughts of peace, and not of evil, to give you an expected end. 12 Then shall all of you call upon me, and all of you shall go and pray unto me, and I will listen unto you. 13 And all of you shall seek me, and find me, when all of you shall search for me with all of your heart. +Let the bad memories be a thing of the past, and know that the best of your life is before us. 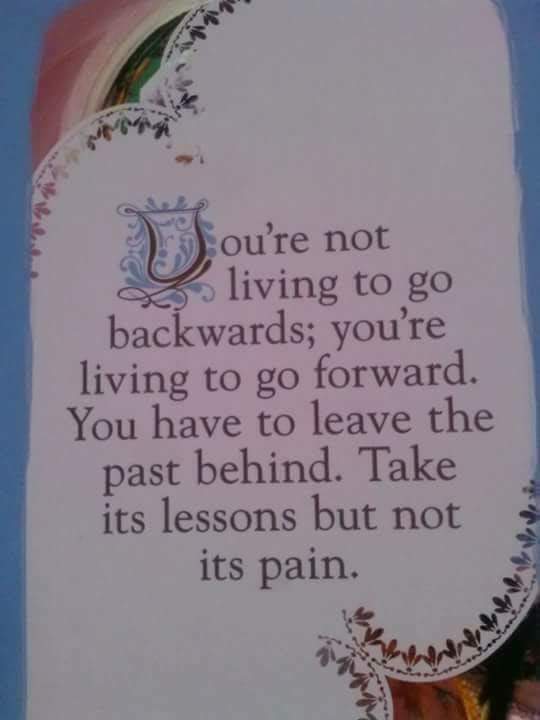 +It’s time to get over past hurts and failures, and move forward in the Abundant Life in Christ Jesus our Lord. Amen! This entry was posted in Daily Message and tagged don't look back. ← ABSOLUTELY NOTHING IMPOSSIBLE FOR GOD TO DO.